Has a debt collector ever contacted you about a debt that you weren’t sure was yours? You have the right to ask them to send proof of that debt. The Fair Debt Collection Practices Act, a federal law regulating debt collectors, allows you to request the debt collector to send proof of the debt through a process called debt validation. You might want to just pay the collection and get it over with, particularly if you know the debt is yours and you need to pay it off to have a loan application approved. However, outside of that, there are some very good reasons to exercise your right to request validation of the debt. Verify the debt is yours: Debt collectors have been known to send bills or make calls for bogus debts, so don't assume that a bill from a debt collector automatically means you owe. The letter may look legitimate, but in this information age, it's easy to gather enough information about a person and their financial dealings to create a fake debt collection notice. Confirm you haven't already paid: What if you already paid the debt? You may vaguely remember owing the creditor named on the collection notice or you may recall paying that debt at some point. To be certain, ask for proof. It's your right. Force the debt collector to prove the debt is real: Sometimes debt collectors resurrect old debts in an attempt to make some money. With old debts, there's a good chance the collector doesn't have the original documents proving that you even owe. Would you really pay money to someone who says you owe them, but can't prove you owe? Of course, not. Make sure the collector is authorized to collect the debt: Even if you really owe the money, how do you know the creditor actually hired this company to collect the debt on their behalf? What if you paid the debt collector and the creditor or another collector came after you anyway because the collector was never hired in the first place? Sending a debt validation letter would help you be sure you're paying the right company for the right debt. Within five days of its first communication to you, the debt collector is required to send a written debt validation notice to you. This notice will state ​your right to dispute the validity of the debt within 30 days. The FDCPA allows the collector to include the debt validation notice in the initial communication if that communication is a letter. If the debt collector’s first communication with you is a phone call, you should receive a debt validation letter from them within five days. If you don’t dispute the debt in writing within 30 days, the debt collector has the right to assume the debt is valid. During the 30-day period, the collector can continue attempts to collect the debt from you until it receives your validation request. To be legally valid, your request for proof must be made in writing. A verbal phone request for debt validation is not enough to protect your rights under the FDCPA. In your validation letter, you can dispute the entire debt, part of the debt, or request the name of the original creditor. Once the debt collector receives your validation request, they cannot contact you again until they've provided you with the proof you've asked for. The best way to send your debt validation request is via certified mail with return receipt requested. This way, you have proof that the letter was mailed, the date you mailed it, and you can check to see when the debt collector received your letter. If you have to file a lawsuit against the debt collector, the certified and return receipts will help strengthen your case. You can show that you mailed the letter within the 30-day time frame and that the collector received it. After receiving your dispute, the collection agency must send you proof that it owns or has been assigned the debt by the original creditor. Verification that you owe the debt and the amount of the debt needs to include documentation from original creditor (you'll receive it from the debt collector, not the original creditor). It is not enough for the collection agency to simply send you a printout of the amount owed. If the debt collector does not verify the debt, it is not allowed to continue collecting the debt from you nor can it sue you or list the debt on your credit report. 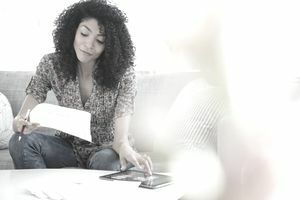 You can dispute the debt with the credit bureaus if the collector continues to list the debt on your credit report even though it hasn't responded to your debt validation noticed. Send the credit bureau a copy of your debt validation letter along with the certified and return receipts to help get the account removed from your credit report. If you receive sufficient validation of the debt, you have to decide what to do next. Confirm the debt is within the statute of limitations - that's the amount of time a creditor or collector can use the courts to collect a debt from you. A debt that's outside the statute of limitations poses less of a threat to you since the collector can't win a judgment against you in court (as long as you can prove the statute of limitations has passed). Check to see whether the debt is still within the credit reporting time limit. Most negative information - like a debt collection - can only be listed on your credit report seven years from the date of the delinquency. If the date of your delinquency is more than seven years ago, the debt should not appear on your credit report and, in that case, it won't hurt your credit to continue not paying the debt. If the debt collection is old and scheduled to be removed from your credit report in less than two years, you may just let it fall off your credit report, especially if you're not planning to get a major loan in that time period. What if the debt collection has been verified, is within the statute of limitations or the credit reporting time limit? You can try to settle with the collector for a percentage of the amount owed or offer a pay for delete agreement if the account is listed on your credit report. Paying in full is also an option - one you might choose if you plan to apply for a major loan before the debt drops off your credit report. Ignoring the debt, however, can have negative consequences: damage to your credit, continuous debt collection attempts, and possibly even a lawsuit.